I am pleased to say that I am planning to run a Rogue Trader/Second Edition/Necromunda campaign for my partner and I in the near future! She loves Genestealers so inevitably they will be involved somewhere in the narrative (and my growing cult will be expanded further to facilitate this)...along with some other special models I have acquired!! However every campaign needs it's protagonists and in this case it will be my girlfriend's alter-ego, the powerful Inquisitor Athena of the Emperor's Holy Ordos. Despite her potency an inquisitor alone would not stand much of a chance against the enemies of the Imperium, and so she will need a force of warriors to command in order to thwart the machinations of evil. I think they came out pretty well, ready to smite the foes of the Inquisition with powerful volleys of laser fire. 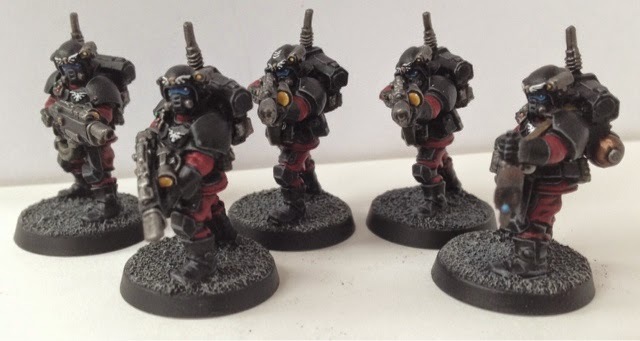 I love these old metal Kasrkin/Storm Trooper models, they are such great sculpts and with their menacing visors they really fit the image of faceless Inquisitorial heavies. After a rather fabulous long weekend away with the other half and our friends I was lucky enough to squeeze in a quick game of second edition 40k this morning! Two games in a week....I'm spoiled! Today my opponent was my long time best mate who has been collecting 40k since we were housemates together many years ago. Unusually one of his annual leave days luckily coincided with one of mine... A rare occurrence indeed ... And so we decided to run an impromptu battle in the Dark Millennium to celebrate this monumental occasion! This time the armies involved in the fighting were my Crimson Fists Astartes versus his Black Templars...as both these venerable Chapters descend from the Imperial Fists Legion this was set to be a very close fratricidal feud! Finally we would find out who the most resolute Sons of Rogal Dorn really are. 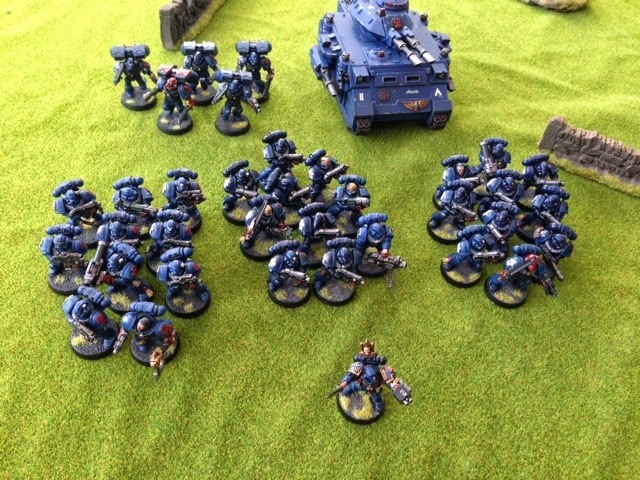 We drew our mission cards, the Templars being tasked with 'Take and Hold' whilst my own Crimson Fists had been given an 'Engage and Destroy' Mission. In short this meant that my opponent needed to seize and dominate an objective in the centre of the table whilst I needed to kill as many of his warriors as possible...brutal stuff! 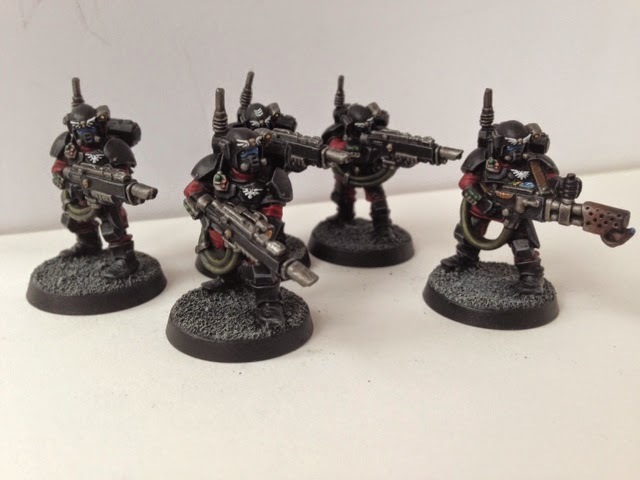 In this battle each of the Imperial Fist's successor chapters fielded three full tactical squads, a demi-squad of assault marines and a Predator tank under the overall command of a veteran Space Marine Captain. First off let me start with a sincere apology for my prolonged absence of late! I have embarked upon a large hobby project that is sucking out a lot of my time and the results are slow to say the least...hence the lack of recent posts! However let me assure you that when this project is done there will be a full, in-depth post and it will almost certainly be worth the wait!! In the meantime my dedicated girlfriend has treated me to a Valentine's game of second edition 40k.... Truly there can be no greater expression of love! I kept the game deliberately small for two reasons, firstly I was going to use a new army that I haven't fielded in second edition before (Iron Warriors from Codex Chaos) so I wanted to learn their nuances gradually...and secondly because I didn't want the game to take too long. 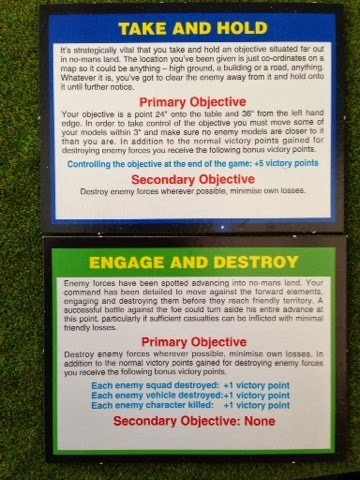 As per usual we drew the cards for our missions, my girlfriend drew 'Engage and Destroy' meaning she would need to kill a vast number of enemy units to gain victory points, whilst I drew 'Take and Hold' which required me to seize and defend an objective in the middle of the battlefield. 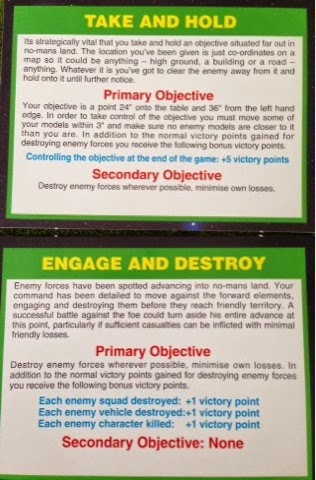 Ubiquitous Second Edition Mission Cards at a degree of randomness and purpose to each game. Whilst my force consisted of the grim forces of The Iron Warriors, let by a Chaos Lord and an Icon Bearer with the blasted standard of Tzeentch... Both of whom were clad in tactical dreadnought armour.